Overview: In India, the ground handling regulation is a very topical issue in Indian aviation meanwhile, the industry of Automotive, Transportation and Warehousing is growing with the significant usage of effective and latest technologies in the category of general transportation. Whereas, the services of ground handling in Indian market will continue to be driven by rising air traffic and significant increase in the number of airports in India. The airport ground handling services in India include three types of airports in India such as Private Airports, PPP Airports and Greenfield Airports. For instance, the ground handling services describes the servicing of an aircraft while it is on the ground and generally parked at a terminal gate of an airport. Many airlines made a subcontract of ground handling with the airports, handling agents or even to another airline. Most of the ground services are not directly connected to the authentic flying of the aircraft, and instead involve with other tasks. The new effective policies in the ground handling services in Indian market enable airport operators, Air India or its holdings or any other facilitator selected through bidding, to transmit out these activities, which array from passenger check-in, baggage and cargo handling to refueling of aircraft and cleaning. Whereas, the airport authority in India manages around total of 125 airport, which include 7 Customs Airports, 12 International Airports, 78 Domestic Airport and 26 Civil enclaves at Military Airfields. Moreover, this authority of India releases a manual notice for procurement of goods and services which is proved to be beneficial for general public as is being circulated for public comments. Not only has this, a notice for caution is also released regarding the fraudulent recruitment. 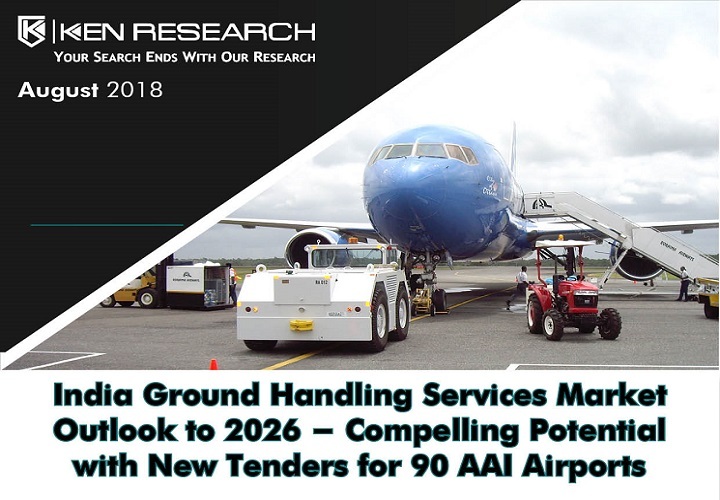 The regulatory framework for ground handling services market in India include MOCA-GHA 2017 regulation and guidelines which formulate the general regulations, and regulations related to Airports, Self-Handling, GSE (Ground Support Equipment), and Security. Furthermore, IATA and BCAS Regulations and Guidelines and Civil Aviation Requirements (CAR) for Ground Handling at Airports are some other regulatory framework bodies for this market in India. Whereas, Air India Air Transport Services limited is the foremost player in terms of profits in the Indian market of ground handling services. Drivers And Restraints: Increasing Air Traffic (Passenger and freight), Growth in Number of Airports and Airline Fleet Sizes, Modernization and Expansion of Airports in India, Technological Advancement in Ground Support Equipment (GSE), Ground Handling for Foreign Airlines, and Rising E-Commerce Increasing Demand for Cargo Handling are the major growth drivers in the Airport Ground Handling Services in India. By the increase in the growth of the airport ground handling services industry have to face some restraints also such as Labor Training and Costs LaborUnions, Severe Weather Conditions at the Airport, and Accidents at Airports. The Indian market of ground handling services transmits self-handle with the majority of their international and domestic operations. Whereas, the third party ground handling business in India does not allowed foreign airlines to self-handle. This is complemented by some under-the-wing activities for Indian transporters. The airlines pursue to direct a strong apprehension about the subcontracting to a third party because of the possible impact on costs, efficiency of turnarounds and quality of services. Airlines are also very much apprehensive that the volume of supplementary business which the third party services providers will have to handle will overpower them and clue to a deterioration in service quality, on-time performance and improvement in the efficiency, all of which will have to material influence on the passenger observation. Classification of Services: In India, the ground handling services market has been split by the types of services which include passenger and ramp handling services and cargo handling services. The passenger and ramp handling services are served in passenger flights and cargo handling services are facilitated in the flight of freighters. Not only has this, the earning from passenger and ramp handling services are has registered a handsome amount of share in the market with the huge number of high frequency of travelers in India. Conclusion: The significant increase in the level of implementation of favorable government schemes in the ground handling and aviation sector will be the major contributor to this growth. Therefore, in the coming years it is expected that the market of ground handling services in India will grow more significantly over the decades with the advance development in the technology and increase in the tourism.